Pallas Quist, DUG Master Community Gardener, leads a Growing Green workshop in Denver. What do you get when you mix 25,000 seed packets with 29,000 vegetable transplants and 18 organic gardening workshops? Thousands of happy Grow a Garden participants for the 2017 gardening season. Grow a Garden is the new name for Denver Urban Gardens Free Seeds and Transplants program. This program helps income-qualified individuals, families and gardening groups by providing free seeds, plants and know-how for growing productive vegetable gardens. 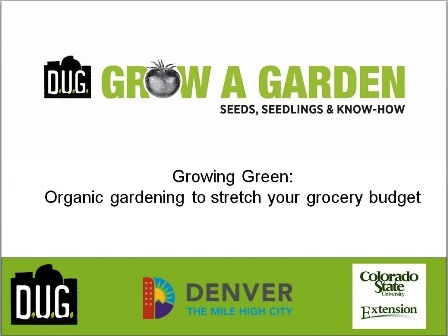 This year DUG is partnering with CSU Extension to present the “Growing Green” vegetable gardening workshops. This collaboration represents a full circle of gardening education because CSU Extension initially offered similar workshops to the community about 20 years ago. DUG developed the workshop content and slide show to focus on organic gardening basics for growing fruits, vegetables and herbs. The goal is to help gardeners of all levels plant, grow and harvest their homegrown fresh produce to help stretch their grocery dollars. 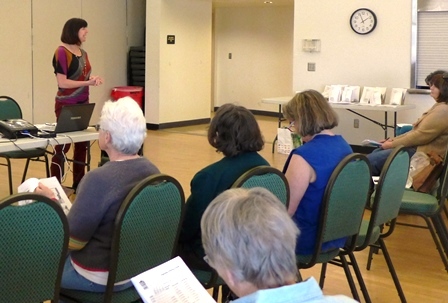 Teams of facilitators—a DUG Master Community Gardener and a CSU Master Gardener—met at a train-the-trainer session led by Jessica Romer, DUG’s director of horticulture and Dan Goldhamer, CSU Extension horticulture agent. Facilitators then joined forces to present information for getting started, planning and designing the garden, amending the soil, timing the planting, and maintaining the garden. Like CSU Extension Master Gardeners, DUG’s Master Community Gardeners attend horticultural training classes, but they also have specialized training in community gardening and community organizing. It was a unique and satisfying collaboration for volunteers from both organizations. After the workshop, Grow a Garden participants picked up their supply of seed packets so they could start planting their cool-season gardens. Warm-weather transplants, like tomatoes and peppers, will be available at distribution centers in May. As continuing support through the season, Grow a Garden participants can attend any of DUG’s other gardening classes for free. This entry was posted in Food Security, Vegetables and herbs and tagged Denver Urban Gardens, vegetable gardening. Bookmark the permalink.